Enjoy this Egypt short break for 3 days in Cairo and experience the landmarks of Cairo, discover the ancient Egyptian sites, see the amazing Pyramids and many more during your 3-day short break in Cairo. 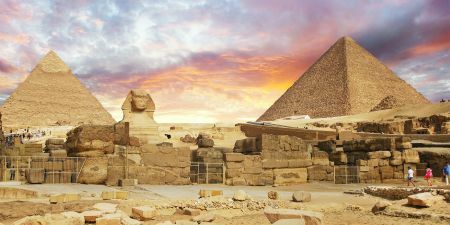 Breakfast at your hotel in Cairo and then met by your personal tour guide who will accompany you to Giza Plateau to visit one of the seven wonders of the ancient world, the Great Pyramids of Cheops, Chefren and Mykerinus, famous Sphinx and Valley temple facing the great statue. Lunch at good quality local restaurant. Then transfer to enjoy the Egyptian Museum, Treasures room for the child king Tutankhamen. Continue driving to Islamic Cairo, where you will be able to explore Khan El Khalili, Cairo’s old bazaar. Overnight in Cairo.